The FAA is investigating a potentially serious incident involving an Air Canada jetliner at SFO Sunday night -- this being the second occasion this year that one of the airline's flights averted what could have been a disaster. SAN FRANCISCO (KGO) -- This was the second time Air Canada was involved in a potentially serious incident at SFO. 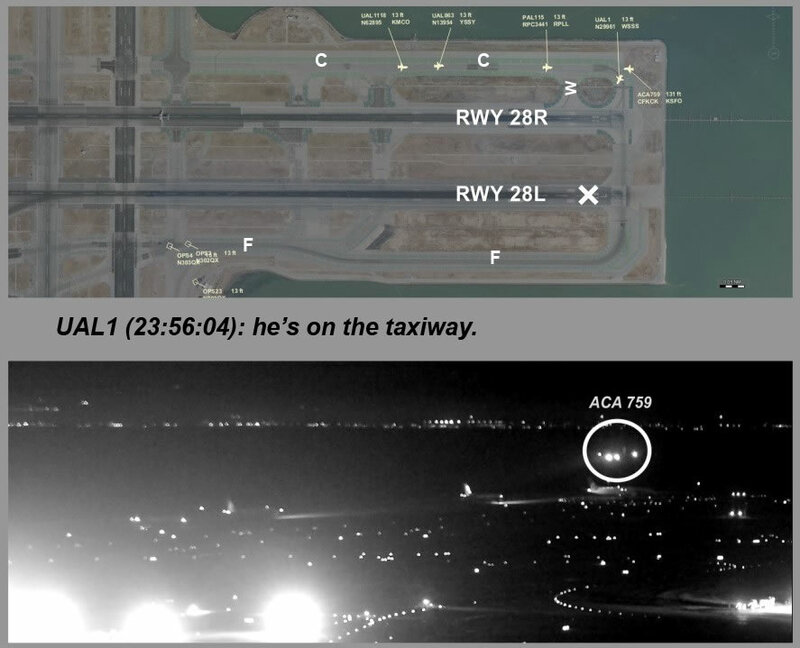 This image provided by the NTSB on Aug. 2, 2017 shows a near-miss at San Francisco International Airport involving an Air Canada flight. In July, one of their planes came within 59 feet of crash landing into other planes. THe pilot mistakenly thought the taxiway was a runway. Sunday night, Air Canada flight 781 from Montreal was on approach to land when air traffic control believed another plane was on the runway. Air traffic control believed another plane was on the runway and repeated instructions to go around six times. The pilot did not respond. The tower operator then activated a flashing red light to alert the crew. "The light is very bright -- handheld by the tower operator who usually brings it down from the cieling, holds it in his hands -- aims it directly at the cockpit of the airplane," said Harry Sharp, a retired Delta pilot who has flown for some three decades. "The lights are so bright, so effective that they're very difficult to miss." Fortunately, the Air Canada jet landed safely but the crew never acknowledged the tower's radio orders or the warning lights. Air Canada issued a statement which says in part: "Upon landing, the crew was informed the tower had attempted unsuccessfully to contact the aircraft. However, the message was not received by the crew." "It's just impossible for me ot comprehend a radio failure going on that long in our modern environment with modern radios," said Sharp. Another possibility, as remote as it sounds, is that the radio frequency may have been hacked. Sharp says that happened only once in his career as a Navy fighter pilot in Vietnam when the enemy jammed his radio in foggy weather hhoping he would fly into a mountain range. The Canadian TSB says it is "aware of the incident" and is following up by trying to obtain more information. USNTSB is also aware of the incident but is not investigating, however; the FAA is. Air Canada statement: "Air Canada flight AC781, an Airbus A320 was travelling from Montreal to San Francisco on the evening of Oct. 22. After receiving proper clearance to land it proceeded to do so and landed normally. Upon landing the crew was informed the tower had attempted unsuccessfully to contact the aircraft, however the message was not received by the crew. Air Canada is investigating the circumstances."